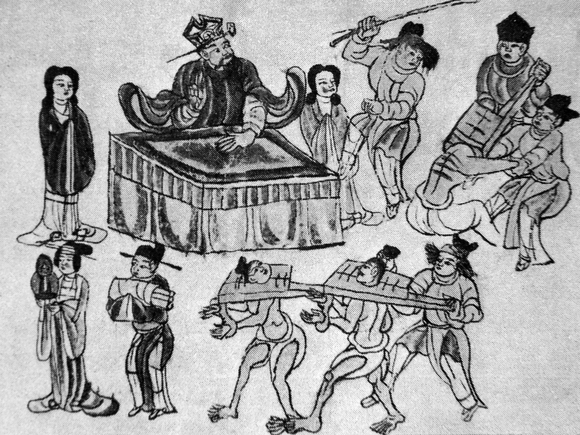 During the Tang dynasty the very worst crimes were called the Ten Abominations. The Ten Abominations were divided into four major categories of crimes. The first category contained crimes against the emperor including threatening to carry out a rebellion. Doctor malpractice could also find its way into this category, especially if the doctor did not follow the proper formulas for the emperor's medicine. The next category was composed largely of crimes of treason. This category included switching allegiances, killing a superior, or betraying a city. After recapturing the capital city of Luoyang from An Lushan, the Tang executed 39 of 200 officials who chose to switch sides and fought against them. The third category was for crimes against the family. This category included murdering a family member, selling them into slavery, or failing to provide proper support for an elder family member. In Tang China the heads of the household had the final word, and they did everything they could to support this social order. It was considered normal for a father to flog his son, but if a son struck a father he could be punished by death. The final Abominations category contained laws against sorcery and poisoning. It also included penalties for multiple murders which were sometimes committed by what was called gu poisoning. Gu poison was a concoction that was made by mixing venomous centipedes, scorpions, spiders, snakes, toads into a pot. It was then given to the unknowing victim or victims in their food or drink, destroying their organs and causing them to vomit blood. At this time the Chinese police force was called the Gold Bird Guards. If the Gold Bird Guards were trying to apprehend a criminal the law required that able bodied bystanders help. If the criminal was armed and the bystanders killed him they were not legally accountable. In 754 AD there were 1,900 prisons. At this time the average sentence was in months not years, but this was not always the case for tax evaders. Some prefectures (counties) punished tax evaders severely, even forcing their sons to finish the prison time if the father died while serving his sentence. Jails were sparsely furnished with a bed pan for human waste and a bed of rush mats. Rich people were kept separate from the poor, and the jail cells were easy to escape. The most serious criminals were chained or manacled at the ankles to prevent them from escaping. Male prisoners who were facing the death penalty were kept in a cangue. The cangue was made out of two rectangular two and a half foot boards. The boards each contained a half circle that joined together around the criminals neck. This made it impossible for him to sleep, go the bathroom, or escape. Prisoners also were forced to wear wooden handcuffs. The prisons did not provide food or clothes. It was up to the prisoners’ family. Tang law clearly dictated 5 different types of punishment. The first two types involved thrashing the perpetrator with a thin 31/2 foot long rod. Criminals were thrashed on the thighs and buttocks. The next category was penal punishment that ranged from 1 to 3 years. The fourth punishment was exile. Criminals were sent up to 1,000 miles away and forced to work. This could happen if you married someone who was not Chinese. They also punished thieves in this manner. The most serious punishment was execution. Under Tang law there were 144 crimes that were punishable by strangulation and another 89 crimes that were punished by decapitation.